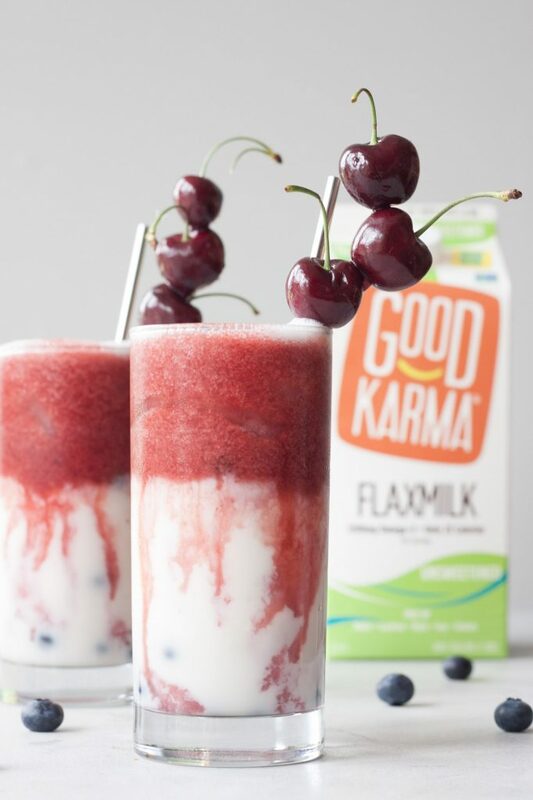 Today’s Berry Cherry Bomb Drink recipe is sponsored by Good Karma Foods. The 4th of July is just around the corner and I don’t know about you but in addition to celebrating America’s Independence Day many people are spending time with family and friends. Not only on the 4th but leading up to it I like to make patriotic themed eats, treats, and beverages to celebrate this time of year. When Good Karma asked if I would like to create a fun festive recipe for the 4th of course I said yes. We love their flaxmilk and probiotic drinkable yogurt, especially in smoothies. It’s a great way to add in nutrition as it’s a dairy free, vegan, plant-based milk packed with omega-3 and contains as much calcium and vitamin D as dairy milk. With only 25 calories in the Unsweetened Flaxmilk it’s a great way to add creaminess to smoothies and smoothie bowls without a lot of calories and no added sugar and we adjust sweetness to taste if needed depending on what we’re blending in. Their #PourItForward campaign also came to mind and always inspires me to spread goodness and inspire others. They believe there is a positive rippling effect in the tiny but mighty act of goodness we see and do each day. No matter how small I try to teach my girls to brighten someone’s day or make them smile. This could be as small as a hello, buying someone a coffee, helping a neighbor, just being there to listen to a friend, leaving a note or flower on someone’s car or doorstep, or even telling your teacher or anyone how much you appreciate them. The options are endless and with small acts the world can be a brighter and happier place, believe in karma, good karma. Using this for inspiration I wanted to create a fun healthy recipe that everyone could enjoy and might brighten the day. Back to this drink! Ombre drinks are all the rage at a local coffee shop and as fun as they look the girls haven’t been fans so of course I set out to make one at home. 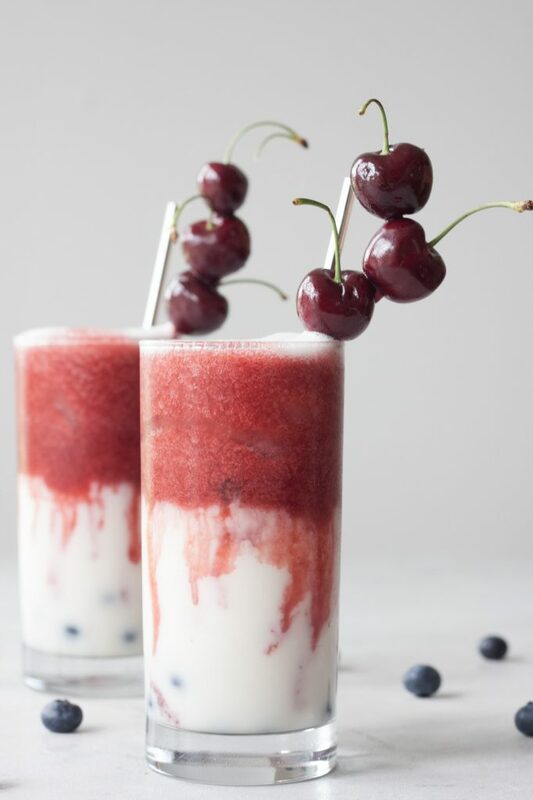 Ombre smoothies and drinks aren’t new, I’ve posted many over the years but I wanted to set out to make a fun patriotic one. When I think about Independence Day foods cherries and berries are the first thing to come to mind. Followed by corn on the cob, grilled veggies, ice cream, root beer, and the list goes on. 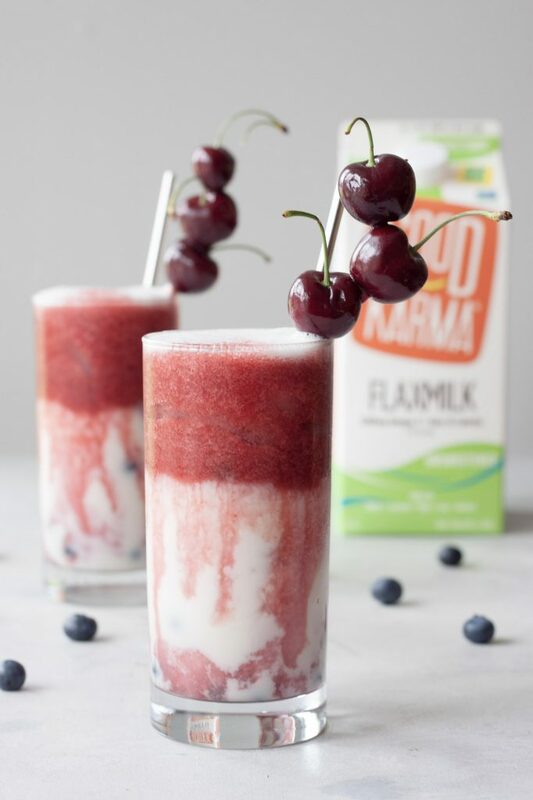 After playing around and taste testing, I have two of the best helping me all day in the kitchen, we have a fun, healthy, kid approved Berry Cherry Bomb Drink! It reminds me of the calm I get watching my affogato drinks and the coffee floating down. Waiting and watching it float isn’t your thing you can also play with the layers with your straw or stir things up. 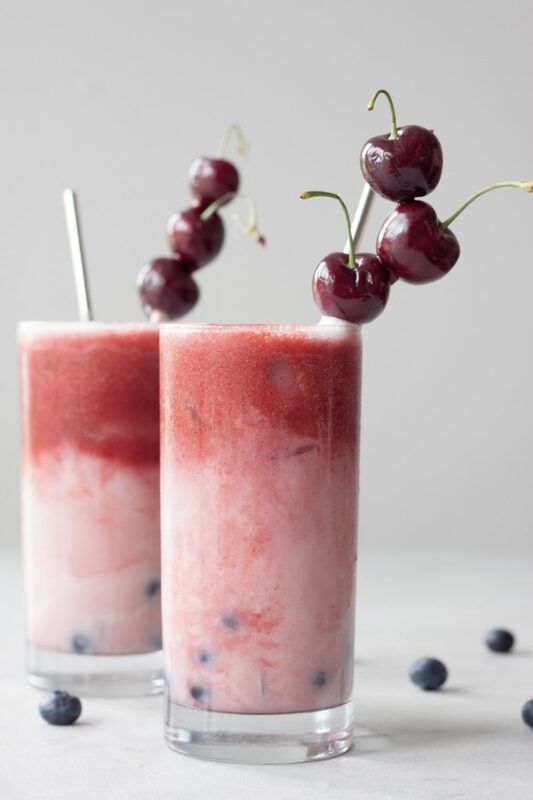 This plant-based patriotic drink is not only fun for the 4th but can be enjoyed all summer long, because if you asked my girls they’d tell you this Berry Cherry Bomb Drink is “da bomb”! Of course I’m too old and couldn’t tell you that. Another thing that screams summer and 4th of July is a good picnic and right now Good Karma is giving away a pretty awesome picnic prize pack, check it out and enter here! 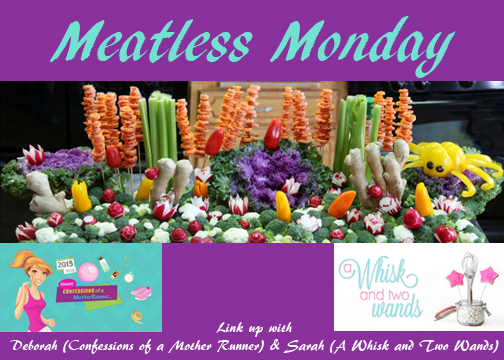 It’s also Meatless Monday, can’t forget that. If you aren’t inspired by this plant-based recipe I hope you are inspired by one of the ones linked up below. If you have one to share my co-host Deborah and I would love to have you join us and link up below. 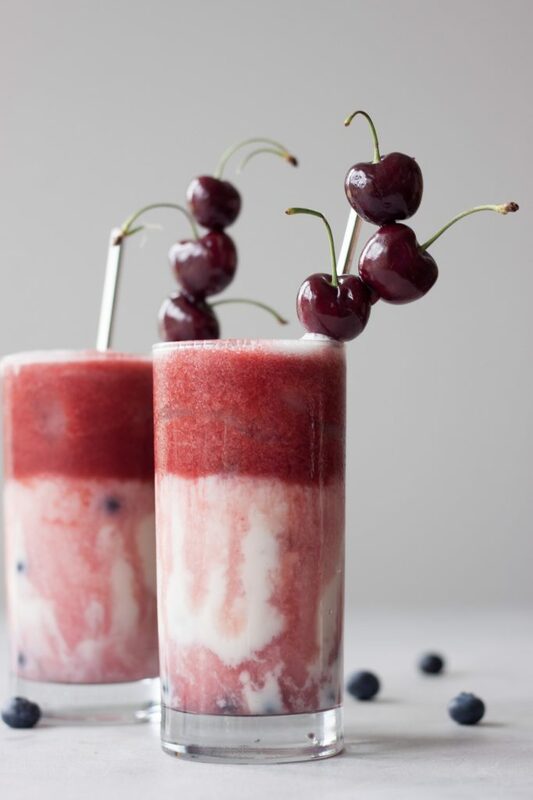 Fun fruity drink that's perfect for sipping on the 4th of July or all summer long. Bright cherry and strawberry layer floats down mixing with sweetened flax milk. If adding cherry garnish thread cherries on a wooden skewer and cut to length for the glass you are using. Fill one or two glasses with fresh blueberries, if making one you will only need 1/4 cup of blueberries. Top with ice, filling glass 2/3rds full. In a Vitamix, or high-speed blender, blend together flaxmilk, banana, and optional sweetener to taste. Pour mixture over ice and berries. Rinse blender, no need to wash it, and add cherries, strawberries, and 1/2c of lemonade/tea and blend until smooth. The mixture should be pourable, adding in more liquid if needed. If it's thicker and not pourable it will float to the bottom of the glass. Pour over the milk layer and garnish with cherries. Enjoy! 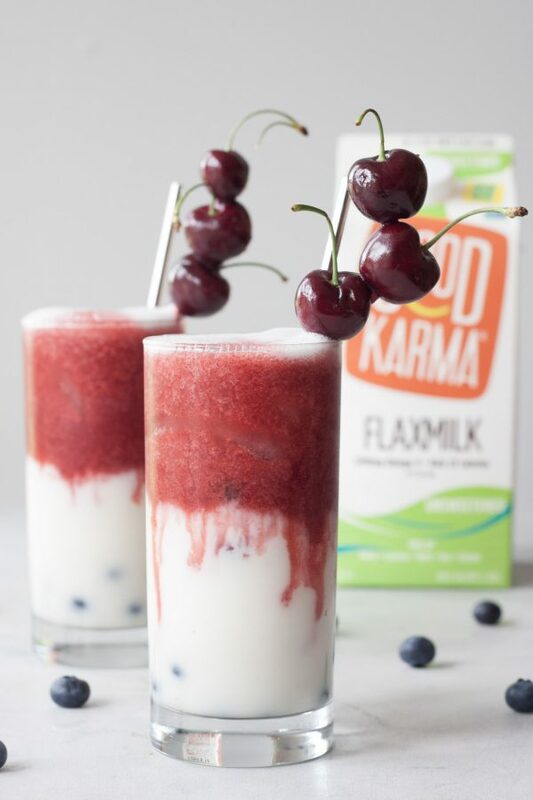 We use Unsweetened Good Karma Flaxmilk and add sweetener to taste. If you use Vanilla or Original Good Karma Flaxmilk you may not need to add sweetener. We use a fresh banana but if you want more of a smoothie texture you can use a frozen banana and omit ice. While the blueberries will not fit in a standard straw and the girls just eat them after they are fun but can be omitted for young children. Thank you Deborah! Definitely healthier. Hi Sarah! This looks incredible!!! Love the fresh flavors. Thanks for hosting. I love how you topped this off with those cherries–so cute and such a great presentation! <3!! Thank you, fun and festive! This drink sounds so good! I love the ombre look. On a random note – how is the unsweetened flax milk on it’s own? Does it have a strong taste at all? Can you drink it plain or do you prefer a sweetened version for drinking it solo? It doesn’t have a strong flavor or taste. I’m not a fan of it heated in coffee. I would say it’s comparable to almond milk in that I’d do the same things with flax as I would with almond although we usually use it in smoothies. I don’t like drinking sweetened non dairy milk in general unless I make it homemade and sweeten to taste. Or I guess sweetened coconut in a drink, I guess it depends on what kind of milk. This drink sounds fantastic. Perfect for a hot day! This just sounds like summer! Appropriate title, because this drinks looks da bomb! I love all the colours and the flavours in this recipe! MMM I’m so happy its coming upon cherry season! Love cherry season, I try to get in as many as I can while I can! Love cherries! I always try to eat as many as I can when they’re in season! They’ve been really good, I can’t stop eating them! So many of my favorite fruits in here and who doesn’t love cherry? Looks super refreshing! Aren’t summer fruits the best? Thank you! This looks perfect for summer. I love cherries and their anti-inflammatory benefits. I’ve never tried flax milk before, but I really want to! This looks so good, and I love that it’s a treat with healthy benefits too! Yes, so many reasons to love cherries! It’s really good, especially in smoothies for adding omegas and creaminess without calories or sugar. This looks delicious! I haven’t tried Good Karma yet, but I have several coupons so I’m looking forward to getting my hands on some. Thank you! I hope you get to try it soon. The drinkable probiotics and plain flaxmilk are our favs, especially in smoothies. This is the bomb dot com! What a fun drink for the holiday! Thank you, it’s such a great combo! I’m always looking for new ways to use my vitamix! Can’t wait to try this! My Vitamix has to be my favorite kitchen tool. What can I say? This drink looks simply amaaazing! Plus all those healthy benefits! Double win! Flax milk? I’ve never heard of it but I want to try it. You’ll have to check it out, it’s great for getting in some omegas! Thank you, cherries are a summer fav! What a fun drink! Perfect way to stay cool and refreshed this summer! Can’t wait to make this! Thank you Taylor, hope you enjoy it! Now that is an amazing bomb! I think I need to get these ingredients for an end of week treat. Thank you Alisa! I hope you have a great weekend. These look so good! I want to drive one up right now! These look so good! I have not tried flax milk, I’ll have to pick some up my next shopping trip! Thank you! You’ll have to check it out, it’s great for omegas so we like adding it to our smoothie rotation. Cherry and strawberry combo sounds so fruity and amazing. I never tried flax milk. I need to fix that asap.